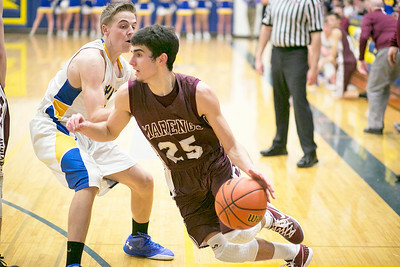 Daryl Quitalig - For Shaw Media Marengo guard Zach Knobloch (25) drives the ball during the boys basketball game Tuesday, Jan. 26, 2016 at Johnsburg High School in Johnsburg, Ill. The Indians won, 56-55. Daryl Quitalig - For Shaw Media Johnsburg forward Tanner Kreassig (12) shoots the ball during the boys basketball game Tuesday, Jan. 26, 2016 at Johnsburg High School in Johnsburg, Ill. The Indians won, 56-55. 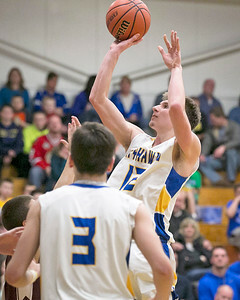 Daryl Quitalig - For Shaw Media Johnsburg forward Joe Bein (21) shoots the ball during the boys basketball game Tuesday, Jan. 26, 2016 at Johnsburg High School in Johnsburg, Ill. The Indians won, 56-55. 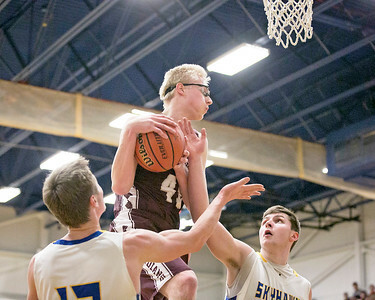 Daryl Quitalig - For Shaw Media Marengo forward Benjamin Volkening (40) secures a rebound during the boys basketball game Tuesday, Jan. 26, 2016 at Johnsburg High School in Johnsburg, Ill. The Indians won, 56-55. 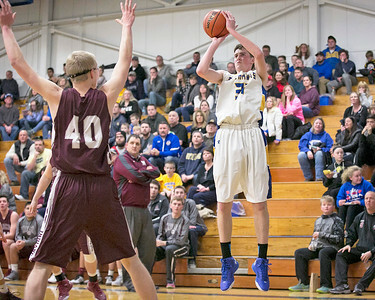 Daryl Quitalig - For Shaw Media Johnsburg forward Michael Shelton (31) shoots a three-point shot during the boys basketball game Tuesday, Jan. 26, 2016 at Johnsburg High School in Johnsburg, Ill. The Indians won, 56-55. 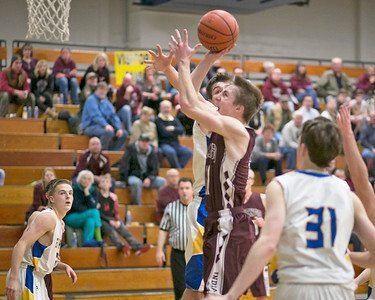 Daryl Quitalig - For Shaw Media Marengo forward Benjamin Volkening (40) shoots the ball during the boys basketball game Tuesday, Jan. 26, 2016 at Johnsburg High School in Johnsburg, Ill. The Indians won, 56-55. 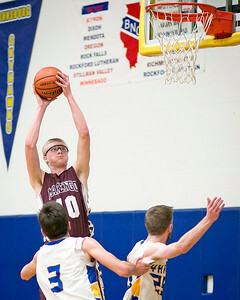 Daryl Quitalig - For Shaw Media Marengo guard Michael Volkening (11) shoots the ball during the boys basketball game Tuesday, Jan. 26, 2016 at Johnsburg High School in Johnsburg, Ill. The Indians won, 56-55. 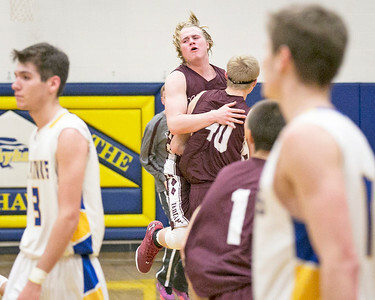 Daryl Quitalig - For Shaw Media Marengo forward Colton Wightman (45) jumps into Benjamin Volkening's (40) arms after securing a victory against Johnsburg Tuesday, Jan. 26, 2016 at Johnsburg High School in Johnsburg, Ill. The Indians won, 56-55. 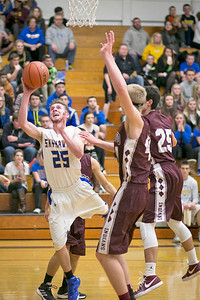 Daryl Quitalig - For Shaw Media Johnsburg guard Nick Whiting (25) shoots the ball after being fouled during the boys basketball game Tuesday, Jan. 26, 2016 at Johnsburg High School in Johnsburg, Ill. The Indians won, 56-55. 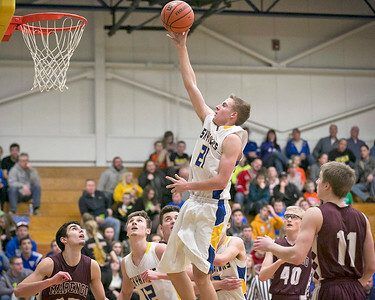 Johnsburg forward Tanner Kreassig (12) shoots the ball during the boys basketball game Tuesday, Jan. 26, 2016 at Johnsburg High School in Johnsburg, Ill. The Indians won, 56-55.